As I said in my previous post we took a trip around the island of Kefalonia and one of our stops was the famous town of Fiskardo. It was exactly how I pictured it, flowers everywhere with the town right on the waters edge, glistening with turquoise colours and buildings with wooden shutters, just the authentic greek vibe I'd longed to see. 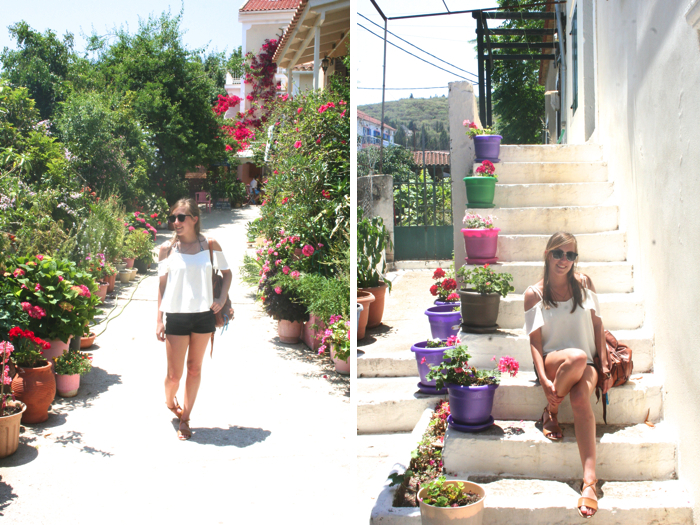 There were little roads all over the town with plant pots lining the path, it was just stunning. Considering the weather was on the rather hot side this off the shoulder top was perfect for a day of travelling. Since borrowing this top from my twin I have become a lover of anything of the shoulder as you will gather from the next few outfits I hope to shoot soon. I never realised there was a part of my body I liked until I realised I liked how my shoulders and collar bone looked when wearing the top, I'm really sold on this trend. Another thing I wanted to mention was these sandals, I had been searching for some brown sandals with an over the toe strap and I never realised how picky I'd be till I started looking. It wasn't until a few days before our holiday that I found these for an amazing price of just £10 and so I prayed they'd get delivered to me in time and I was in luck! I love them, even the crossed straps they're so simple and easy to wear, I'll be surprised if they leave my feet, well unless the weather is horribly rainy like it is today so looking back at these photos is giving me such a longing to be back under the Greek sun. I thoroughly enjoyed taking these photos as for once I didn't feel self conscious about anyone giving me funny looks, but maybe because everyone was being a touristy and it was just normal to do so here. That being said, if anyone has any tips on beginning to feel confident in front of a camera then please share!